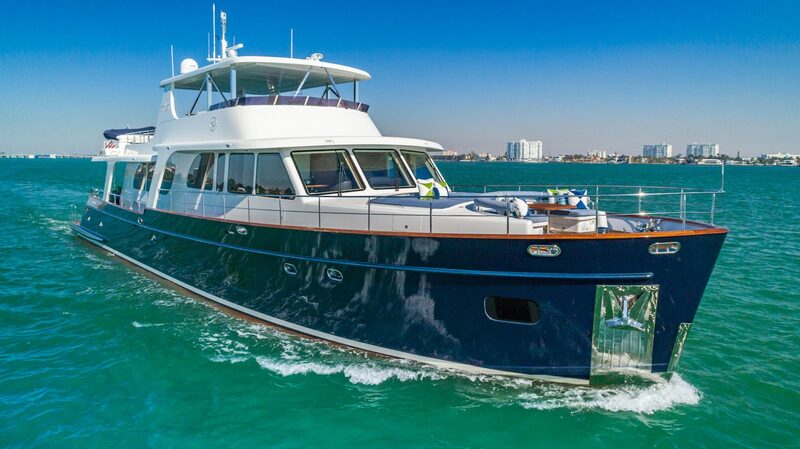 An elegant and spacious yacht, built in 2013 by Vicem, MONI is currently lying in the USA. Design work is by the Vicem team, and she features high headroom, large windows and shallow draft. Able to welcome up to 10 guests, with five spacious cabins, MONI carries a crew of six. Guest accommodation includes the large full beam master cabin, with high windows and luxurious fittings, two VIPs and two twins. All cabins feature full entertainment systems. Indoor and outdoor spaces abound, with exceptionally high ceilings providing a feeling of added space. The large main salon is the heart of the yacht and features timeless yet contemporary styling and luxurious fittings to create a true retreat for guests to relax or socialize. An elevated dining space sits up a level, with a full formal dining table for 10 and a raised ceiling that gives an open and spacious feel. A fully equipped modern galley is nearby for seamless service, while far forward on the main deck is the pilothouse.